The Maryland Department of Natural Resources announced that a Delaware resident won this year’s Maryland Black Bear Conservation Stamp Design Contest, while the award for top Migratory Game Bird Stamp Design went to a resident of Des Moines, Iowa. The winners were chosen by a panel of judges March 17 at the 18th Annual Eagle Festival at Blackwater National Wildlife Refuge in Cambridge. 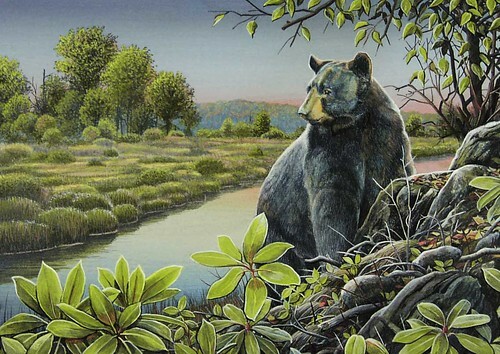 Steve Oliver of New Castle, Delaware won the 22nd Annual Maryland Black Bear Conservation Stamp Design Contest with his painting, “Looking Back.” The artwork portrayed a lone black bear sitting on the edge of a creek with the first hints of fall. This is his eighth win since first entering the contest in 2000. “This is fun for me and I enjoy helping out conservation programs whenever I am able,” Oliver said. Proceeds from the sale of Black Bear Conservation Stamps and other related items are used to compensate Maryland farmers experiencing damage caused by black bears. These proceeds are added to the Black Bear Compensation Fund. The bear stamps and other related items can be purchased on the department’s online store. 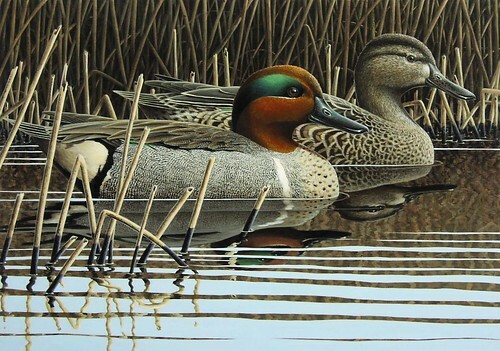 Paul Bridgford, of Des Moines, Iowa, won the 44th Annual Maryland Migratory Game Bird Stamp Design Contest with his painting, “Silent Repose,” a stunning image of two green-winged teal, a drake and a hen, quietly floating amongst the reeds. This is the first year that the Maryland Migratory Game Bird Stamp Design Contest was opened to artists from outside Maryland. Entries were received from artists in seven different states and was highly competitive. The artwork will be featured on the stamp hunters purchase to hunt all migratory game birds in the state with the proceeds funding migratory game bird research and habitat enhancement on public lands. Since 1974, stamp sales have provided more than $8 million for migratory game bird projects.